Some friends are kind enough to volunteer with answers. There are different kinds of answers, and they remind me of this story. A gentleman saw three men laying bricks. I suppose we are free to think we’re building a cathedral (or mosque or synagogue or temple, whatever floats your boat) by working in advertising. I also believe it is up to us to define our own version of cathedral. This is a little story about my cathedral. You can say that I got the glimpse of my cathedral even before I knew what I could do to help build it. Marilyn and Mother got me into advertising. Both of them are two versions of print ads for Nike Women in 1989, written by Janet Champ and Charlotte Moore when they were still at Wieden + Kennedy. I was still in high school back then (yes, I’m old). My mother worked in the magazine business, so she often brought home imported magazines for her reference and our entertainment. From her I borrowed a copy of a women’s magazine, and this print ad stopped me. I read it several times; each time I got goose bump. You do not have to be your mother unless she is who you want to be. 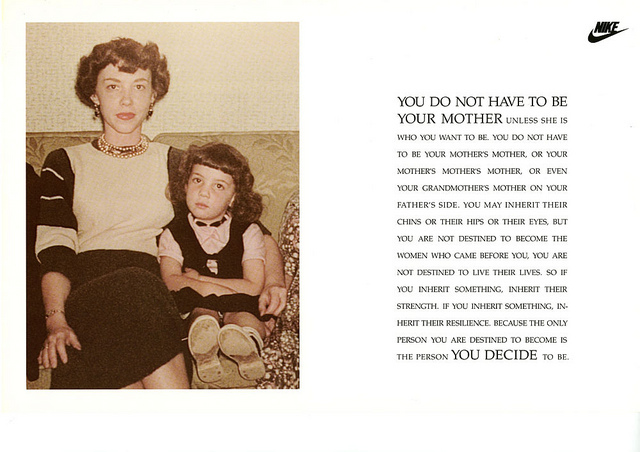 You do not have to be your mother’s mother, or your mother’s mother’s mother, or even your grandmother’s mother on your father’s side. You may inherit their chins or their hips or their eyes, but you are not destined to become the women who came before you, you are not destined to live their lives. So if you inherit something, inherit their strength. If you inherit something, inherit their resilience. Because the only person you are destined to become is the person you decide to be. Few days afterwards, I borrowed another women’s magazine from her. Lo and behold, I couldn’t get my eyes off Marilyn. A woman is often measured by the things she cannot control. She is measured by the way her body curves or doesn’t curve, by where she is flat or straight or round. She is measured by 36-24-26 and inches and ages and numbers, by all the outside things that don’t ever add up to who she is on the inside. And so if a woman is to be measured, let her be measured by the things she can control, by who she is and who she is trying to become. Because every woman know, measurements are only statistics and statistics lie. I’m not being dramatic by saying that those ads helped me to become what I am today. The ads moved me, beyond making me feel that Nike was an “it” brand for women. They made me believe I didn’t have to accept being measured by what society considered normal. That I was not destined to be someone who came before me. That I should choose how I measure myself. Also at that moment, I realized that I was fascinated by the power of advertising. Those Nike women ads got me into advertising. I saved them in my computer’s desktop, to remind me that I should not give up working in advertising until I can produce something that’s comparable to Marilyn and Mother. I guess that was my cathedral. It is not about working for a brand like Nike Women (although I will never say no to that) or places like Wieden + Kennedy (yes, please!). Yes, of course advertising supports the free-market economy, something I truly value and am ready to defend. But in my version of building the cathedral, it’s about making advertising that does much more than that. It’s about making advertising that opens up to people –heck, maybe just a young girl or a young boy– that there’s a different way to live your life. That’s there’s a different way to see the world. Yes, it’s about making advertising that expands, not shrinks, possibilities for people. It’s about making advertising that proposes something beyond bigger, faster, or shinier objects: a different perspective. It’s about making advertising that propagates different narratives about who we are and what life is. I think this is important. I believe everybody flourishes and has a bigger chance to prosper in a society that allows and nurtures plethora of narratives. A society that knows how to agree to disagree without having to resort to conflicts. I want Indonesia to be a place for societies like this. Very much so. I believe we Indonesians, having been under faux-democracy for so long, still need to develop these important skills: to think critically, to live with different opinions and narratives, to agree to disagree. And advertising provides us a safe training ground to train them. Of course you can disagree with me, pointing that it’s just a feeble attempt to justify my “evil” day job and my decent paycheck. Nevertheless, I will still keep Marilyn and Mother on my computer’s desktop. I need them to remind me to continue trying and be humble. Are you building a cathedral, dear readers? What is it? → When should we leave our agency? Thank you for the encouraging words, Lynda. Hi Mita, nice piece, love it. Hi Wid, thanks for dropping by. Hi Mita, this is my first time to visit your blog. This piece is really good and all I can say is that I have massive respect for those who work in advertising. HI Mita, I have read many of your blog posts and they are all very informative. I am thinking of making a career change from IT into advertising and these posts has been very useful for me.